Nexus Gold (TSX-V:NXS) entered into a letter of intent to acquire the McKenzie gold project in the Red Lake region of north-western Ontario, Canada. The Oreninc Index fell again in the week ending February 1st, 2019 to 14.92 from 20.23 from 28.08 despite metal prices showing growth. Gold continued to improve, hitting an eight-month high as US Federal Reserve chairman Jerome Powell stated that the case for further rate increments had “weakened”. The US Labor Department reported that new unemployment claims increased 53,000, to 253,000 claims in January, above what economists were expecting. The unemployment rate rose to 8.1% from 7.6% a year ago. With gold having broken through the US$1,300/oz mark and held, its next resistance levels are at $1,330 and $1,350. Number of financings decreased to 13, a three-week low. Total dollars increased to C$20.3m, a two-week high. Average offer size augmented to C$1.6m, a two-week high. Orion subscribed for 7.0 million shares @ C$1.58 for aggregate gross proceeds of about US$8.3 million. Premier issued 2.0 million warrants exercisable @ C$2.05 for three years. An amended and restated silver stream agreement pursuant to which Orion paid an additional deposit of US$10 million to Premier which will deliver to Orion 100% of silver production from the Mercedes mine and of the silver production from the South Arturo mine attributable to Premier until the delivery of 3.75 million ounces of silver after which the delivery will be reduced to 30%. Orion has security over assets relating to South Arturo and Mercedes. The proceeds will be used for the development, construction and working capital requirements for South Arturo. Premier also obtained a US$50 million secured revolving term credit facility with Investec Bank. 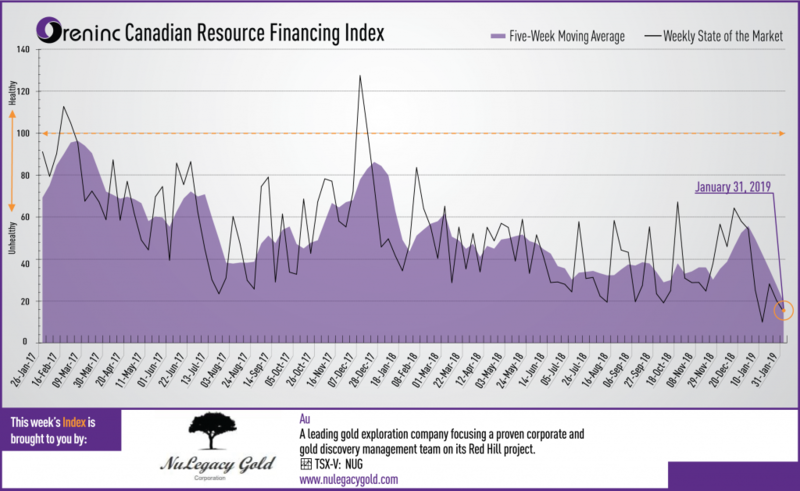 Premier Gold Mines (TSX:PG) opened a C$06 million offering on a strategic deal basis with Orion Mine Finance. Each unit includes a warrant that expires in three years. Tethyan Resources (TSX-V:TETH) opened a C$3.2 million offering on a strategic deal basis with Augusta Investments. Each unit includes a warrant that expires in five years. Chatham Rock Phosphate (TSX-V:NZP) opened a C$02 million offering on a best efforts basis. Each unit includes half a warrant that expires in two years. Lupaka Gold (TSX-V:LPK) opened a C$1.0 million offering on a best efforts basis. Each unit includes a warrant that expires in two-and-a-half years. The deal is expected to close on or about February 28th. Tethyan Resources (TSX-V:TETH) closed a C$2 million offering on a strategic deal basis with Augusta Investments. Each unit included a warrant that expires in five years. Miramont Resources (CSE:MONT) closed a C$65 million offering on a best efforts basis. Each unit included a warrant that expires in two years. Wealth Minerals (TSX-V:WML) closed a C$58 million offering on a best efforts basis. Each unit included half a warrant that expires in two years. Victory Resources (TSX-V:VR) closed a C$05 million offering on a best efforts basis. Nexus will issue 6.0 million shares and a one-time cash payment of C$150,000. The McKenzie gold project is a 1,349-hectare property with a geological setting analogous to several past producers. It hosts nine documented historical gold occurrences with limited exploration. In 2017, a ground reconnaissance program resulted in a prospecting discovery, with high-grade samples returning up to 313g/t gold.